Sometimes, all you can do is look up, smile and say “I know that was you, God.” Well, God coupled with a super-cool new friend who also happens to be a redhead named Laura…coincidence? I think not! Ever just have one of those days where you are tapped out, frustrated and feeling over-worked and under-appreciated? Yesterday was ‘it’ for me. On the drive home from a long work-day, I was feeling burned out and (there’s no other way to put it) positively pissy. I’m normally pretty even-keeled and die-hard positive, so I tried to mutter my usual litany of positive things to myself in an attempt to re-set my attitude, but the stress seemed to have a strangle hold on me and it felt like an avalanche of negativity was flooding my consciousness. I was recently asked by a local magazine to help them with an article they are planning on “Cool Jobs”. They wanted to interview and photograph me, not for my everyday office job, but for my other job of “Cowgirl”. It tickled me that that’s how they chose to describe the job of a ranch wife. It’s not a feature piece, and it’s no big deal, but I thought my readers would enjoy the snapshot that sums up my thoughts on farm life, so I attached my answers to the interview questions below. A pic I snapped today, while doing my regular job of “cowgirl”. How/why did you choose this career? Well I guess you could say it kind of chose me. I was fortunate to be raised on a farm and it’s really all I ever wanted to do. 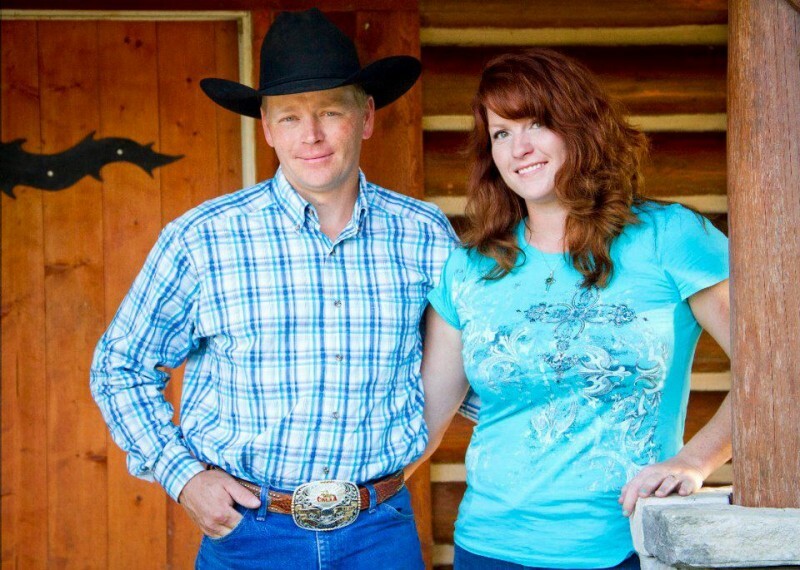 I met and married my husband when I was only 18, and he always had the same drive and ambition that I did, to someday own a little piece of land, and raise cattle and horses. We didn’t start with much, and we weren’t fortunate enough to have land passed down to us, but acquiring our own little ranch has been more than worth the blood, sweat and tears. And it took a whole lot of all of the above. How long have you had this job? For the past 15 years with my husband, but really since I was a small child I’ve done the same type of work on the farm. Please describe what you do (I realize there are several sides to the ranch, so don’t feel limited on space — write as much as you need to cover your work). 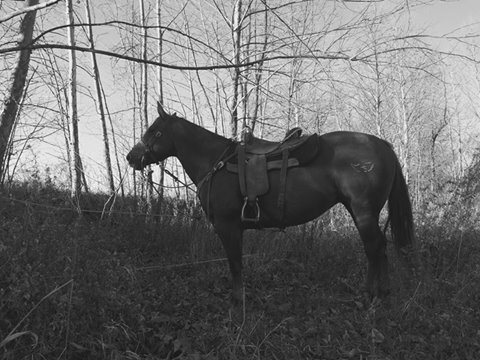 We raise a small commercial herd of black-angus cross cattle, and American Quarter Horses, focusing on quality over quantity. Our horses are all animals we’ve trained ourselves for the sport of cowboy mounted shooting (cmsaevents.com for more info) and we spend a lot of time and work really hard keeping them fit and training them, and we are on the road competing nearly every weekend during the warmer months. We have to do a lot of practice with both our guns and our horses, to stay competitive. Over half of our cattle actually belong to our children, Katie (18 and a freshman in college) and Zane (7 years old). The cattle require a lot of upkeep, it seems we are kept busy almost constantly with feeding, worming, vaccinating, fixing fence, watering, & just general care of them. But we also run a small business creating livestock branding irons, and my main role in that endeavor is as the graphic designer. We realized a while back that there weren’t any companies out there that were willing to help people design the branding irons, so we were able to fill that niche and create a new business opportunity. I really enjoy helping people tie their own ranch and cattle or horse operations together, with a distinctive symbol. In addition to all of this, I also keep an active blog sharing our farm life with others, at thegategirl.com. What do you love and/or find cool about this job? What I love most about it is the chance to be outdoors and be close to nature, and live close to the land. My daddy always taught me that the best way to relieve stress was hard work, and he wasn’t wrong. It’s hard to be stressed if you’re digging post holes by hand, or fixing fence. You get out there and do what needs done, and when you’re finished, your worries seem to be a lot less. I don’t think there are many jobs out there that you can say that about. The main reason we do what we do, though, is because we want our children to remain tied to the land. We feel that’s so important, that they know how to identify sick calves and doctor them, train a horse, operate machinery, fix fence, and help a neighbor when they need it. There’s just so many things that the farm life teaches children, and while we believe strongly in a higher education, we also believe that kids just really can’t get that strong core, anywhere better than the farm. These are things my husband and I talk about, and planned out years ago. Our goal has always been to raise children that are capable, tough, kind, wise, and strong (both mentally and physically), and I believe you have to set the example for your children. Ranch work allows us the opportunity to do that. We don’t always do everything perfect, and our kids see that, but what they do see is that we care about our animals, and we work very hard to make sure they have the best possible care taken of them. The biggest thing I was taught as a child on the farm was that it was OK to fail, or to fall short, but it wasn’t OK to just not try. That’s also the number one lesson I want our children to learn. Our daughter is 18 now, but I knew we had succeeded the day she called me at work and told me she had to save a newborn calf out of the icey creek. She was 12 years old at the time, and home by herself in the early spring. She went down to check on the cattle and found that Polly-cow had her calf, but it had slid down the creek bank on the ice and was standing belly deep in freezing water. She had a cell phone, but she knew I was in town and her dad was working, and by the time either of us got there, it would be too late. She went back and got our best horse, saddled her, roped the calf and drug it up on dry ground, then toweled it off and made sure it was nursing before she left. She could have failed at saving that calf, but it would have been enough that she had just tried, and done what she could. She knew that, so she tried. And she saved it. She called me after she already had everything taken care of,when she got back in the house and had put the horse up. What are the rewards of this job? Getting calls like that from your 12 year old daughter, and having your coworker say “My 12 year old kid can’t even cook a frozen pizza!” Ha! No, but really they are too numerous to mention. The early mornings feeding the animals, watching little calves play, or feeling that incredible connection with a good horse. Seeing your kids play in the creek or the satisfaction that comes from doing chores every night and knowing all the animals are healthy, happy and fed. The only way I can sum it up, is to say that when you lay your head down on your pillow at night, you sleep sound, and to me? That’s the best life you can have. What was the coolest thing you’ve gotten to do in this job? I love everything about it. But I can sum it up best by saying: The opportunity to work hard beside my husband and my father to accomplish huge tasks, and know that my husband and my father think of me as an equal, and never even consider the fact that I’m a girl. They trust me to doctor cattle or fix fence by myself, and know the job will be done right. And knowing that my children see that, that’s the coolest part about this job. For those of you that read my earlier Seasonal Resolutions post, you’ll be happy to know I haven’t fallen off the wagon. Yet. I gotta say, my ever-constant quest to stay out of the winter doldrums is going pretty well. I know what you’re thinking: ‘we haven’t technically even hit winter yet’. Well guess what, it’s actually cold outside and I’m not pretending to be Eeyore, so I’m calling it a win. Baby steps. Speaking of baby steps, that’s what my probably-nutty-sounding “seasonal resolutions” are all about. Taking small steps to tackle big things in my life. The first one was finding a way to unplug from my electronics and be more present in my daily life. I’m starting to get a handle on that, so I’m moving on to the next item on the list: taking time for myself.